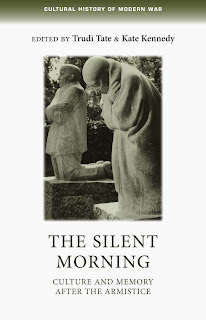 The first book to study the cultural impact of the Armistice of 11 November 1918. This title, by Trudi Tate and Kate Kennedy, contains 14 new essays from scholars working in literature, music, art history and military history. The Armistice brought hopes for a better future, as well as sadness, disappointment and rage. Many people in all the combatant nations asked hard questions about the purpose of the war. These questions are explored in complex and nuanced ways in the literature, music and art of the period. The authors revisit the silence of the Armistice, and ask how its effect was to echo into the following decades. The essays are genuinely interdisciplinary and are written in a clear, accessible style. The book will be arriving in shops at the end of this week – order your pre-publication copy before 14th November, and receive a special 15% discount. Simply contact NBN International on +44 (0)1752 202301, or email your details to [email protected], quoting the code OTH376 to redeem your discount. Category: Art History, Cultural Studies, History, Music, Politics	0 Comments.